I went into this review with no expectations and with very little knowledge of the Koa TR. They feel reasonably light out of the box and look like a shoe for moderate terrain that would perform double duty as a versatile trail shoe. Not to mention, the toe box shape surprised me, as it is somewhat reminiscent of an Altra. The woven mesh upper looks technologically advanced and supportive. Integrated overlays criss-cross the mid-foot and on forward through the forefoot, doing an exceptional job keeping the foot locked into place with a very comfortable, snug and secure feel. The mesh upper is very flexible, streamlined, breathable and sheds water well. The oblique toebox allows for added splay and swelling. Even though the Koa TR visually looks like an Altra from above, for my foot, the Koa TR fits much better, as my foot has a bit of extra wiggle room, but not overly so. The Koa TR provides a nice balance of added room, without overly compromising security when pushing the pace on moderate to technical trails or jamming my toe into the front of the shoe, issues I have found with Altra in the past. 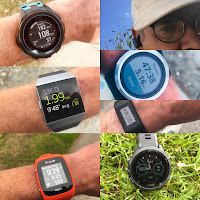 The heel and midfoot feel very locked down and even with the little bit of extra room in the forefoot, it took some really hard running through corners and rock gardens to experience any slide or instability, but even then, it was very little. The length of the shoe is true to size. The woven laces integrate very nicely with the nylon lace loops and I am always able to achieve the perfect snugness on the first try, without ever having to re-tie during a run. The middle lace loops (with the orange) are connected to a mid-foot wrap for added stability. The rubber toe bumper is durable and thick, wrapping generously around the front of the shoe. The heel collar and tongue have very plush padding, adding to the comfort of the shoe. You can also see the orange midfoot wrap inside the shoe. The Koa TR is slipper like, with the non gusseted tongue riding independently underneath the stretch booty upper throughout the lace area. The heel collar is low on the sides, with the heel counter rising comparatively high in the back, but feels very comfortably supportive and locked down. The heel counter is sturdy, secure and protective, without feeling overbuilt. 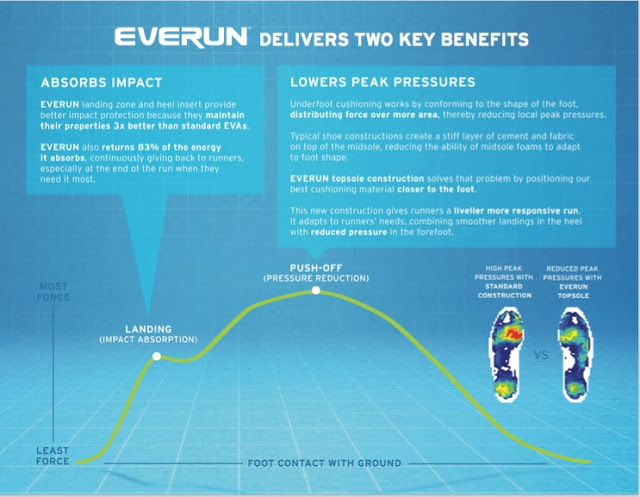 The EVA midsole with full length Everun TPU topsole just beneath the sock liner provides a very nice balance of firm yet forgiving cushioning and responsive performance. Though a shoe with 22/18mm stack height is a little less than I typically prefer for the rocky, technical trails I frequent, the Koa TR has a very protective and supportive feel to it. With the insole pulled out, you can easily see the Everun TPU full length topsole. The PWRTRAC outsole, while very minimally lugged, performs exceptionally well on a wide variety of terrain. This is a true door to trail shoe, that, with the low profile lugs, can easily pull double duty on the road, yet the numerous low profile lugs, coupled with a reasonably sticky rubber compound allow the Koa TR to excel on the trail instead of simply sufficing. I ran in some impressively wet, snowy and muddy conditions several days after a 3+ foot Spring blizzard with the Koa TR and was amazed at how well they handled the sloppy conditions and with some careful (but still fast) running, never had a slip. I am still having trouble placing the Koa TR into a specific category. A daily trainer? Racer? Mellow trails? Door to Trail? All mountain? An alternative for Altra fans? I guess that is a testament to it's somewhat unique level of versatility, as it is all of the above. 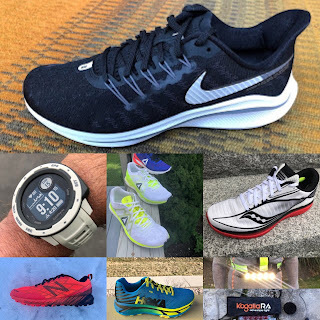 Certainly not the lightest shoe out there, but when running, the Koa TR feels very light, quick and responsive, so I would not hesitate to race in this shoe in just about any race up to 50k. Road performance is very good, but would really only use these for a few miles at a time on pavement and if going longer, there are lighter, more cushioned options available. Ground feel, articulation and lateral stability are all very good, without compromising rock protection. Overall, the Koa TR is a great choice for a do it all shoe (or just about all). I would probably be reluctant to spend much time off trail in the Koa TR (but would certainly consider the Koa ST with 8mm lugs), but aside from steep, loose off trail and perhaps snowy, icy winter conditions, the Koa TR is a fine choice, especially if you run from your doorstep. Saucony Koa TR vs. Brooks PureGrit 6 (RTR review coming soon): Overall, a very similar ride and feel, comparable level of protection, breathability, weight and overall feel. The Koa TR has a bit more generous fit in the toe box. The outsole of the PureGrit 6 is more luggy and provides better traction, especially in looser terrain, but still runs well on the road. Saucony Koa TR vs. Brooks Caldera (RTR review here): The Caldera is lighter with 3 more millimeters of cushion. The Caldera also has a somewhat generous fit, but foothold is overall not quite as good as the Koa TR and the upper is not quite as supportive. The Koa TR has a slightly more durable and reliable outsole with a edge on traction. For long miles on less technical terrain, road, primary door to trail, the Caldera would be my pick though for the slightly softer and more ample cushion. Saucony Koa TR vs. Salomon Sense Ride (RTR review coming soon): The Everun TPU vs. the Vibe is a toss up for me. I find them both to perform exceptionally well in both response and dampening characteristics, though both are a bit firm. Weight is comparable, but the Salomon wet traction Contagrip is superior for a wider range of conditions (especially in the wet) and the Salomon seems to be a more durable and rugged shoe, something to consider if you lean toward running in more rough terrain, yet still handles door to trail well. The Koa was provided at no charge. The opinions herein are entirely the author's. Thanks for the review Jeff. I was looking at this shoe on Saucony's site the other day and was curious about it. Makes me wonder if they retooled the upper of the peregrine and slapped a new outsole on it. Surely they can shave off another ounce from this shoe? The comparison to the Pure Grit 6 looks like the Koa would be a better door to (light) trail option. I'm not sure the outsole of the Pure Grit 6 would ride well on the roads. The past versions that I ran in were fine in the rocky stuff, but not on pavement. At least that was my impression. Any thoughts on how this compares to its predecessor, the nomad? Thanks Ben. Yeah, the Peregrine 7 has .5mm more cushion, yet weigh nearly an ounce less per shoe, so seems possible they could do so with the Koa TR. The uppers have some similarities, but the Koa upper is a bit thinner, less rugged and more breathable. Of course the shape is different, but both are quite comfortable and secure. The PureGrit 6 works OK on the road, but the Koa TR is certainly a better door to trail shoe with the more mellow tread. j, unfortunately, I have not run in the Nomad, so could not compare. Hey Wes, the Koa is a really nice shoe with a more accommodating fit, but not quite as much cushion. The durability of the outsole is much better than the Challenger as well. Xodus ISO is really nice too, but a bit heavier, better cushioned and not as quick or responsive. Depends on your usage I guess. Have you considered the Hoka Speedgoat 2? Thanks Jeff. I have considered the Speedgoat 2 but still wary of that fairly narrow toe box. I have been reading some promising reviews on the Mafate Speed 2. Same grippy vibram sole with 5mm lugs and a good wide toebox and only a slight stack increase. I suffer with hot feet and my toes are really prone to blisters. Mafate could be my choice for my 50+ mile ultras, whereas the Challenger had been my trail marathon choice until my feet couldn't take anymore. Cushioning is key for the dry tracks, with some responsiveness, and with enough grip to get me through some soft grass and mud. Your review of the Brooks Caldera also caught my eye. Too many shoes!! How does the Koa TR compare to the Nike Kiger 4 with regard to midsole cushioning? Anton, I have not run in both shoes (nor has Sam I don't think), but just based on my reading and the stats, I would have to say that the Kiger 4 is a bit more substantial. I found the KOA TR a bit on the light side for my typical rocky, technical terrain, but were great for cruising softer, more runnable trails.